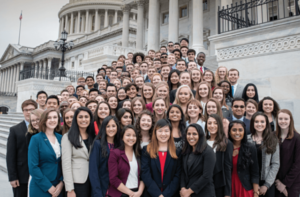 The United States Senate Youth Program, is a unique educational experience for outstanding high school students interested in pursuing careers in public service. The 54th annual program will be held in Washington, D.C., from March 5 – 12, 2019. Two student leaders from each state will spend a week in Washington experiencing their national government in action. Student delegates will hear major policy addresses by Senators, cabinet members, officials from the Departments of State and Defense and directors of other federal agencies, as well as participate in a meeting with a Justice of the U.S. Supreme Court. All transportation, hotel and meal expenses will be provided by The Hearst Foundations. In addition, each delegate will also be awarded a $10,000 college scholarship. APPLY: Students must be nominated by their high school principal to be considered for USSYP. Students are unable to apply to the program directly. Each principal can nominate up to two students. Nominated students submit an application, including an outline of extracurricular activities and career goals, an unofficial transcript and the California Qualifying Examination. For Principals: California state nominations are made through the California Department of Education. For more information, see the Dept. website or contact the state selection coordinator David Carriker at dcarriker@cde.ca.gov.